This morning over at Kirkus, I write about Jeanette Winter’s Henri’s Scissors. That column is here. 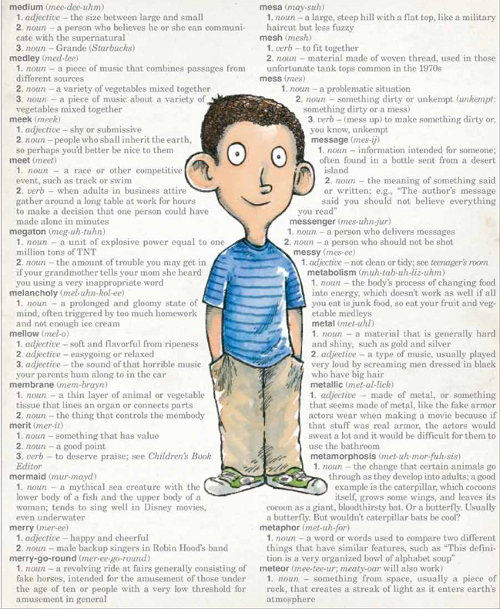 Last week, I wrote here about Jim Tobin’s The Very Inappropriate Word (Christy Ottaviano Books/Henry Holt, August 2013), illustrated by Dave Coverly. Both Dave and Jim are pictured here. (Jim’s the pointy one. Hoo boy, I wonder if Dave just uttered a very inappropriate word. In fact, I’m finding it hard RIGHT NOW to avoid cursing, ’cause I do love a good, creative swear.) Dave says this is the author photo they wanted to use that was nixed by the publisher. Dave is sharing some art and early sketches from the book today. He works on 90lb Arches, using Rotring Rapidograph technical pens, and he then drops in watercolor. Ditto for the the hand-lettering on the cover, he says. Well, there’s always art here at 7-Imp, but it’s I who am taking a break in my work today to post some art from David Díaz. Last week over at Kirkus, I chatted (here) with Alma Flor Ada and F. Isabel Campoy, both pictured below in this post, about Yes! 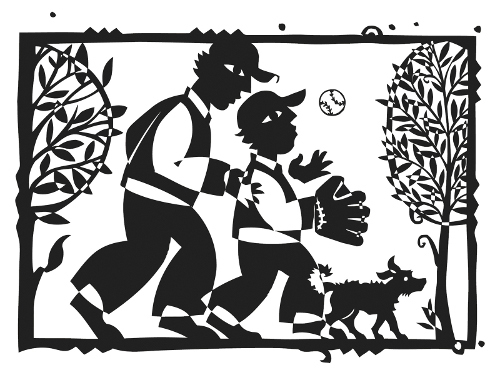 We Are Latinos (Charlesbridge, August 2013), illustrated by Díaz, a series of narrative poems about the various ways Latinos and Latinas in this country celebrate their heritage. So, today I’ve got some art from the book. I also didn’t have room in last week’s column for one final question I had for Ms. Ada and Ms. Campoy, so that question is also included below. 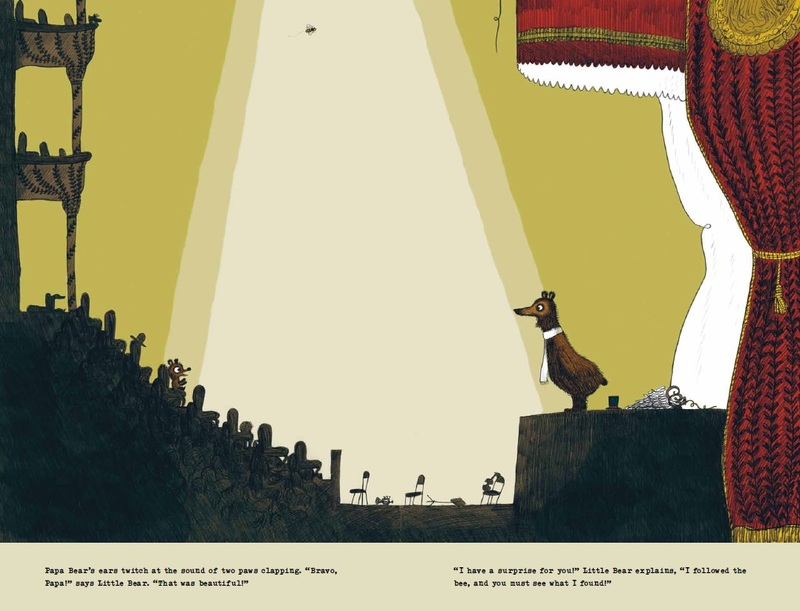 This morning at 7-Imp, I welcome illustrator Antoine Revoy. Antoine was born in France and grew up in Tokyo, Japan, as well as Mexico City, Mexico, and Barcelona, Spain. He received a B.F.A. in Film/Animation/Video from the Rhode Island School of Design in 1999, and after that, moved to China, followed by some time in Dublin, Ireland (as well as Paris again), working as a visual and interaction designer. 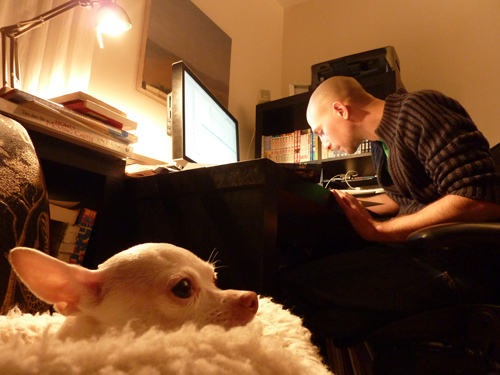 All the while, he worked as a freelance illustrator as well. 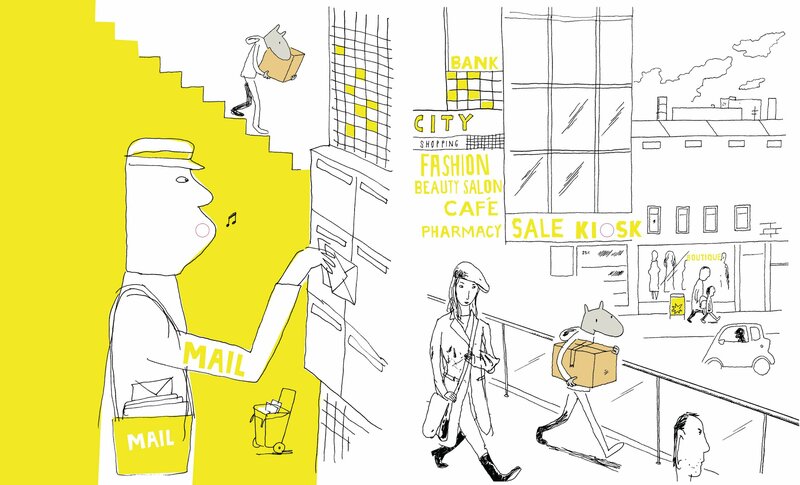 He now works full-time as an illustrator, including editorial work. As you’ll see below, Antoine has a very stripped-down style in his pen-and-ink drawings, often with a compelling use of line and occasional bursts of color. Surreal and mind-bending, his illustrations take us to new places. Oh, but you see, that’s very good with me. I think we’re set. Honest to Pete, every single year, when September thinks about rolling around, I very nearly forget that August marks the birthday of this blog, started back in 2006 with my best friend, Eisha, though I’ve been blogging solo for years now. And it’s happened once again this year, but I’ve caught it in time. 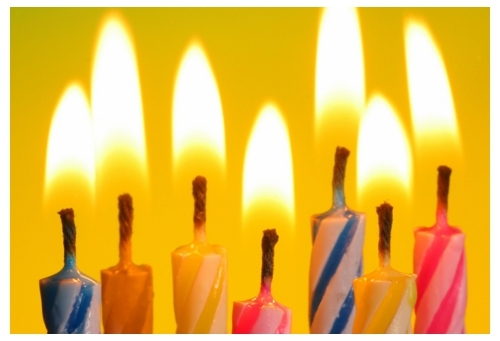 And on its SEVENTH birthday! And since seven is kind of a special number around here, I thought I’d mark it with seven candles. I still love blogging. I really love art. And I am kinda crazy about picture books. As always, I thank 7-Imp readers, as well as all the authors and illustrators who visit here to talk about their work and techniques and illustrations and thoughts — and who share lots and lots of art here. Also, it’s only taken me nearly a year, but finally up in one of the headers of this blog is the Mad Tea Party image created specifically for 7-Imp by artist Susan Sorrell Hill. It’s here. Doesn’t it look lovely? Thanks again to Susan for that special gift. The blog needs updating (for one, I’d love the header to say “a blog about picture books”); some pages need re-organization; and, quite possibly, 7-Imp even needs a new look. But in this day and age of busy social media (more people leave comments anymore at posts about blog posts at social media sites than they do at the actual blogs themselves), I figure it might be a small miracle that 7-Imp is even still around. And, I hope, still relevant. I’m grateful that I still have the opportunity to blog-as-a-hobby about picture books and illustration, which I love. And I’m grateful for the friends and opportunities this blog has brought to my life. So, here’s to seven more years. “Papa Bear’s ears twitch at the sound of two paws clapping. This morning I’ve got an international import, coming to shelves in September from Chronicle Books. Benjamin Chaud’s The Bear’s Song was originally published in France in 2011. 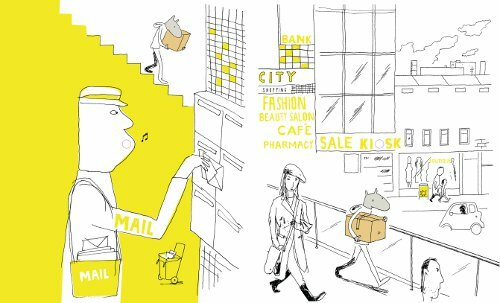 Those of you who closely follow international picture books may recognize Chaud’s name: He’s the creator of the Pomelo books. “Penda lived in a tiny village in Africa with her mum and her aunties. 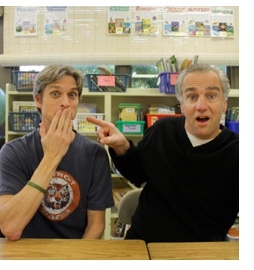 This morning over at Kirkus, I write about Jim Tobin’s The Very Inappropriate Word, illustrated by Dave Coverly. That link is here. 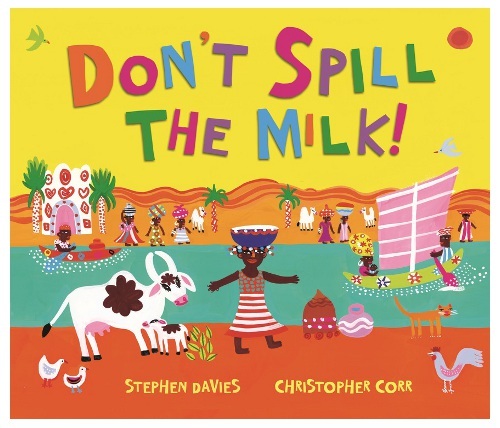 Last week, I wrote here about Stephen Davies’ Don’t Spill the Milk! (Andersen Press, September 2013), illustrated by Christopher Corr. A spread is pictured above. DON’T SPILL THE MILK! Copyright © 2013 by Stephen Davies. Illustration copyright © 2013 by Christopher Corr. Spread used with permission of Andersen Press USA, Minneapolis. Over at Kirkus today, I chat with Alma Flor Ada and F. Isabel Campoy about Yes! We Are Latinos (Charlesbridge, August 2013), illustrated by David Diaz, a series of narrative poems about the various ways Latinos and Latinas in this country celebrate their heritage. Next week here at 7-Imp, I’ll have some illustrations from the book. “The dragon, on hearing the approaching footsteps, made the beginning of a courteous effort to rise. But when he saw it was a Boy, he set his eyebrows severely. 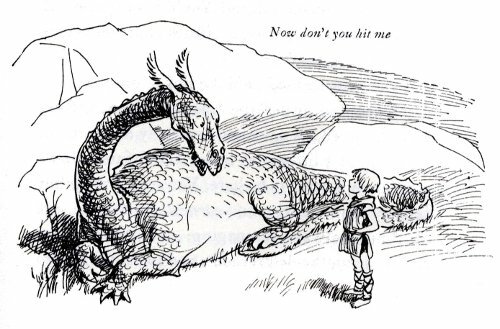 Here’s a quick art stop to say that this year marks the 75th anniversary of Kenneth Grahame’s The Reluctant Dragon, illustrated by Ernest H. Shepard. Holiday House is marking this occasion with an anniversary edition of the book, complete with an introduction from Leonard S. Marcus. If you’ve never read this, Grahame’s most famous short story, it’s the tale of a young boy and a peaceful, sonnet-loving dragon. 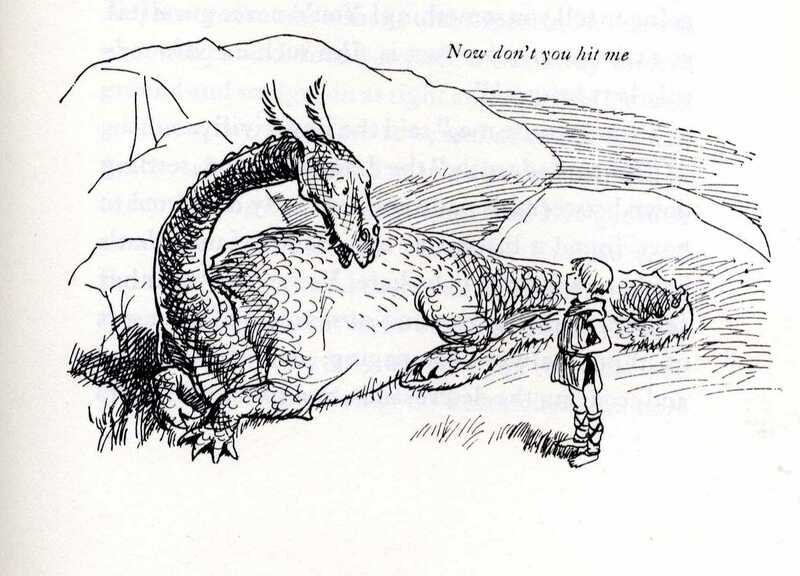 The dragon is hiding out near the boy’s home, which is “half-way between an English village and the shoulder of the Downs.” The boy and dragon become friends, but when St. George arrives, summoned by the town to destroy the dragon, the boy steps in. Instead, a fake joust is staged, and … well, I won’t tell you the entire story, should you want to read it on your own. If you’re wondering whom I’m talking about, I’ll send you here, if you’re so inclined to read. That was a 2011 Kirkus column I wrote about the very delightful Anna Hibiscus chapter book series from Kane/Miller. 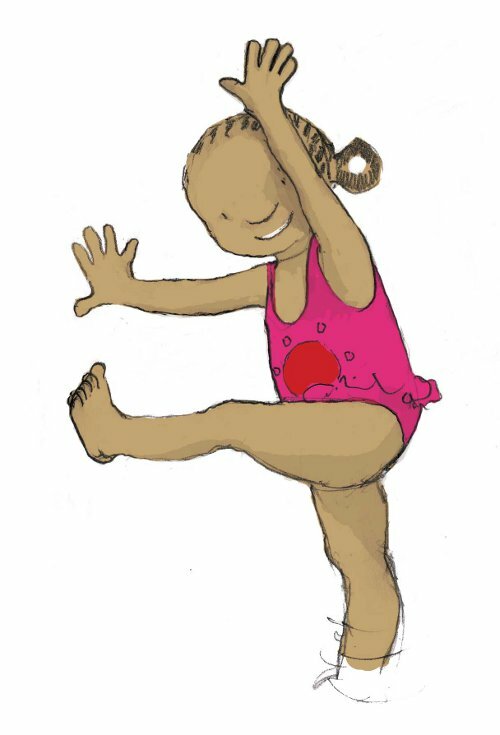 Anna’s appeared in a picture book as well, featured here at 7-Imp in 2011, and now she’s in a new one, Splash, Anna Hibiscus! (also from Kane/Miller). In a nutshell, Anna is a young African girl, living in a commune with her huge family (including a Canadian mother). The series is top-notch reading for children and has been recognized by the Boston Globe-Horn Book Awards (2011). The books are written by Atinuke, a Nigerian storyteller, who spent her childhood in both Africa and the UK and now lives in Wales, and illustrated by British artist Lauren Tobia. In this new story, Anna’s at the beach with her family. She loves the waves but wants to play in the water with a family member — anyone who will just stop being busy to participate in her joy. 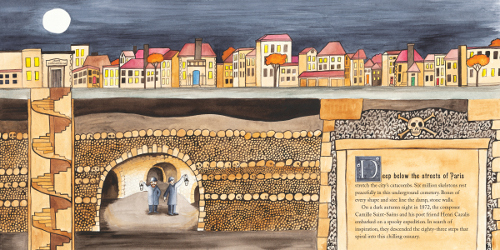 “Deep below the streets of Paris stretch the city’s catacombs. Six million skeletons rest peacefully in this underground cemetery. This morning over at Kirkus, I write about Stephen Davies’ Don’t Spill the Milk!, illustrated by Christopher Corr. That link is here. 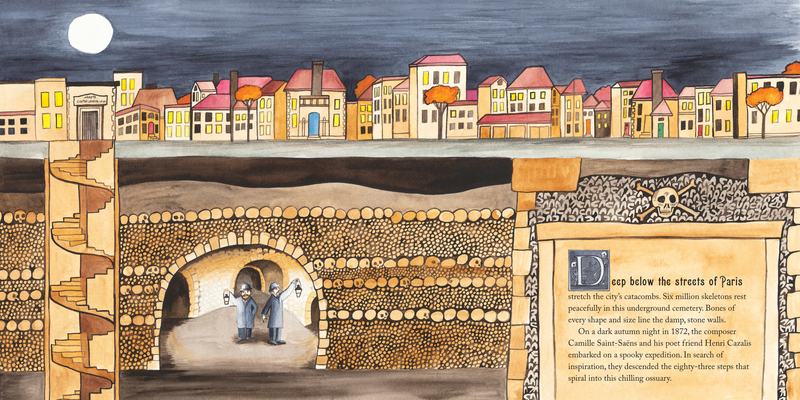 Last week, I wrote here about three new picture books (simply ’cause I couldn’t decide on just one) — Anna Harwell Celenza’s Saint-Saëns’s Danse Macabre, illustrated by JoAnn E. Kitchel and released by Charlesbridge this month; Øyvind Torseter’s The Hole, released by Enchanted Lion this month and originally published in Norwegian; and Jacqueline Woodson’s This Is the Rope: A Story from the Great Migration, illustrated by James Ransome and to be released by Nancy Paulsen Books/Penguin later this month.